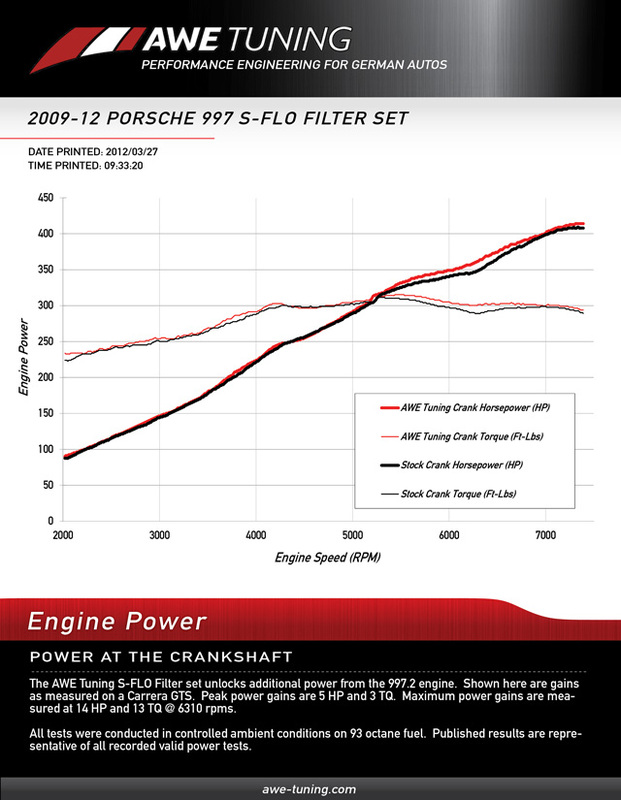 The AWE Tuning S-FLO Filter Set was engineered to improve the 997.2’s ability to draw in cool air while creating impressive power gains. The AWE Tuning S-FLO Filter Set is a drop in, high flow replacement for the restrictive OE paper filters. Employing the same filter technology used by LeMans, WRC and Rolex title winners, each AWE Tuning S-FLO Filter’s tightly woven cotton material not only improves durability and longevity, but can also capture particles as small as 5 microns. Each AWE Tuning S-FLO Filter Set is assembled using a low pressure molding process. Some filters currently on the market us a lower cost, high-pressure molding process that leads to rubber seeping into the filter surface. This spill over can obstruct airflow up to 25%. Low pressure molding ensures that this will not occur. We chose reusable oiled cotton filters because they flow more than the paper equivalent, by design. Designed in-house at AWE Tuning, these are the largest possible filters compatible with the factory airbox. Note: Recommended cleaning intervals for the filter is 10k miles or once a year, whichever comes first. Follow our recommended cleaning intervals and you will be able to enjoy years of improved breathing with a single AWE Tuning S-FLO Filter Set. How 'bout a Rennlist Group buy? This is a purely superficial question but does it improve the intake noise?